Have you noticed that every politician in the US claims to support the Second Amendment? The most anti-gun politicians support the Second amendment, according to their claims. I decided that I wanted to see where our Alaskan senate candidates actually stood on gun rights issues, since all claim to be pro-gun, yet at least two have a record of standing against gun rights at times. I asked all of the senate candidates for an opportunity to discuss firearms issues. Senate candidate Joe Miller agreed to meet with me and discuss his stand on the Second Amendment and gun rights. I brought along a few rifles, of course. 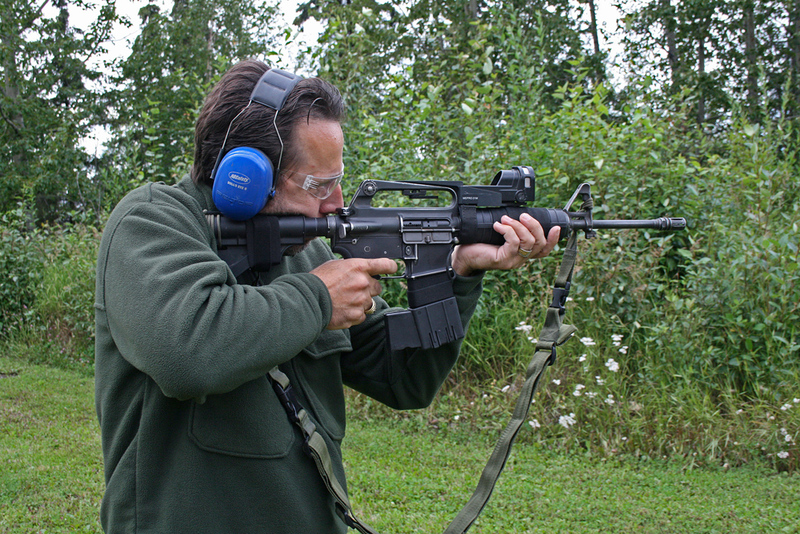 I wanted to see Joe Miller’s reaction to my .50 Beowulf AR-15. It usually gets quite a reaction on the range from those who have not seen one before, and I thought he would be impressed. I also brought my IDF carbine clone. What better way to start a conversation about the current state of affairs in Israel? Both rifles have Meprolight M21 sights on them, which many people are not familiar with, so I expected to get some questions about those as well. Joe Miller, with my .50 Beowulf rifle, talks about the usefulness of the cartridge for Alaskan game. Joe owns a .50 Beowulf rifle himself. Well, it turned out Joe wasn’t surprised at all. He owns a .50 Beowulf AR himself, and also owns Mepro M21 sights. He actually owns quite a few firearms. Joe believes in strictly following the wording of US Constitution. He believes that, as the framers made clear, the Second Amendment protects the basic human right to keep and bear arms in self-defense and in defense of our country. He believes that the Second Amendment applies to individuals. Joe made it clear that he will fight any legislation against semi-auto firearms, or that attempts to limit the magazine capacities or cosmetic features of firearms. If elected, he will oppose any attempt to pass an “assault-weapon” ban. Joe stated clearly that he opposes any attempt to regulate the private sale of firearms between law-abiding individuals, such as requiring background checks, or requiring the involvement of a dealer. Joe is in favor of repealing the 1968 gun control act’s sporting purpose test. This has been used as a backdoor restriction on firearms. Joe also says that he will oppose any backdoor federal restrictions on firearms, including bans on lead, copper, or brass, bans on firearm possession on certain federal lands, etc. Recent legislation, and currently proposed legislation bars people from possessing firearms due to certain misdemeanors or due to military service, based on a doctor’s opinion. In addition, proposed legislation would make it a crime for any person to unknowingly transfer a firearm to a veteran who is diagnosed with PTSD and therefore barred from possessing a firearm. Joe Miller has promised to stand against any such legislation. 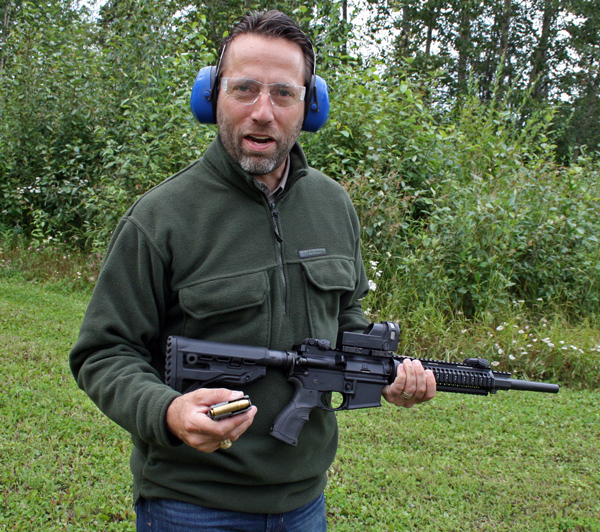 Because Joe Miller believes in a constitutional government, he supports removing many of the restrictions on firearms ownership and use, and opposes the creation of new firearms restrictions. He believes that much of the federal control of firearms overreaches the constitutional limits on federal powers. In speaking with Joe, I realized that his support for our Second Amendment-protected rights does not stem just from his personal interest in guns, a desire to protect his own collection, or from his effort to win an election in Alaska, but from his lifelong stand for the US Constitution, which is a much stronger position. Joe with my .454 Levergun. Joe is a gun collector, hunter, and very strong supporter of our Constitutionally protected rights. Joe also believes that there are many other issues that affect firearm rights in America. Amnesty for illegal aliens is an issue that directly effects gun rights; the heavy-handed anti-gun laws in California came on the heels of a federally-mandated amnesty in 1986. This amnesty changed the voter dynamic in California and helped push the state government into a solidly anti-gun position. Other issues such as unconstitutional surveillance and other privacy issues can set gun owners and dealers up for attack by any unscrupulous administration in the future. Joe Miller is not only a strongly pro-gun candidate, but more importantly, he is a strongly pro-constitution candidate. Across the country, states are electing constitutional candidates. According to a man who is working with politicians in Washington, there is a growing force in congress pushing for a return to constitutional government. We need to make sure that we chose a senator who will join this force, instead of opposing it. Joe Miller has a personal history of standing against corruption and supporting a return to a constitutional government. He has proven willing to oppose corruption and error not only in the opposing party, but within his own party as well. 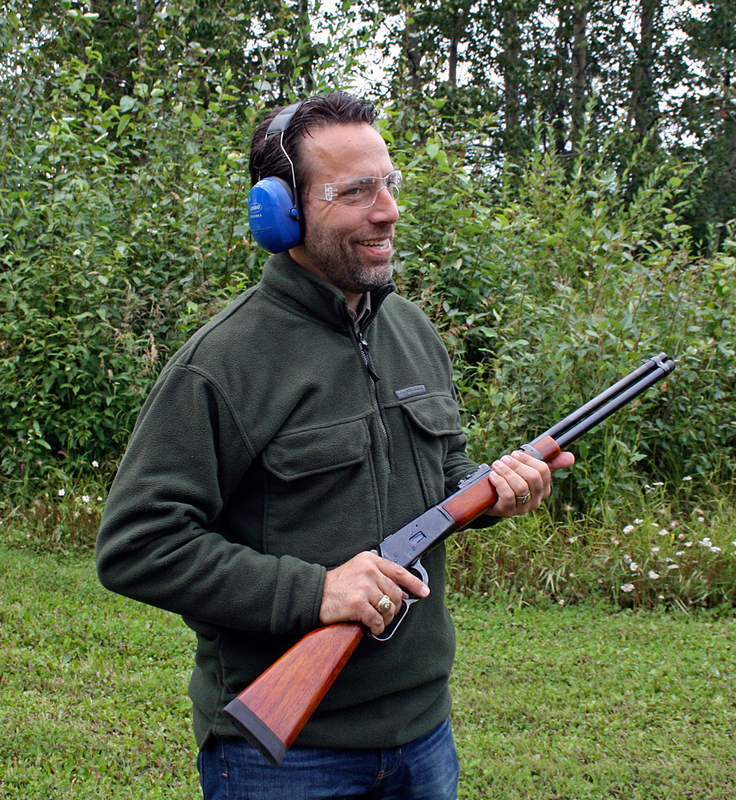 Joe Miller is endorsed by Gun Owners of America, the National Association for Gun rights, and received an A rating from the NRA. Watch for information on the other candidates in the race. If they are willing to discuss these issues with me, I will post the information here. ~ by 7.62 Precision on 14 August 2014.